Online shopping is gradually becoming the order of the day! And if you happen to be a gadget junkie then you can safely rely on the best deals that are available more on the online stores today! Want to get the best of power banks and television sets at a discounted price? Check out the Gadgets Now deals. When you are browsing through the best Gadgets Now deals then you have the scope to bag the best deals in Smartphones, other mobile accessories as well as other essential electronic goods that are required in life on a daily basis. Want to order a trending 4G mobile within your budget? Gadgets Now deals can make it happen for you with as much as 65% discounts on your order. So get browsing the site and sorting the deals and get your offer today. Make sure to use it within the mentioned time to avail the deal. Are you looking for latest mobiles? GadgetsNow is the best place for you. Here it is offering best discounts on top selling smart phones. Here you get upto 20% discount on best selling mobiles like Redmi Note 3, Yu Yureka Plus, Lenovo, Yu Yunicorn, Asus Zen Phone Max, LYF Wind, Micromax Canvas 6, Samsung Galaxy Star Pro etc. Get it now. Gadgets Now is offering flat Rs 1601 OFF on Honor 8 Lite 4G VoLTE. Use this coupon code to get extra Rs 200 discount on your prepaid orders. Buy this 4GB RAM | 64GB ROM | Expandable Up to 128GB mobile at Gadgets Now online portal and get discounts on your online orders. Gadgets Now is offering Rs 300 discount on Moto E4. Use this promo code to get discount on your pre paid order. Here get Moto E4 for just Rs 8149 only. Buy now. Gadgets Now is offering flat Rs 1450 OFF on Vivo V5 mobile. Shop here and get flat 15% OFF. EMI also available for this mobile. No promo code is required to get this discount. Click here and read the specifications and place order now. Gadgets Now is offering flat Rs 2500 discount on Lenovo Vibe Shot. Also get 10% SuperCash on Mobikwik wallet payment. Or use Jio wallet for payment to get flat 5% cashback. Here you get it for Rs 12499 where as the actual price is Rs 14999. Buy now. Gadgets Now is offering best price and FREE shipping on Honor 8 Lite 4G VoLTE (Black, 4GB RAM) mobile. No coupon code is required to get this offer. Read all specifications from landing page. Buy now. Gadgets Now offers flat 16% OFF on LYF wind 4s 4G Volte by applying this promo code. Gadgets Now offers budget phones from Rs 845 onwords. Shop here from mobile brands like Samsung, Nokia, LAVA, InFocus etc and get upto 30% discount. No promo code is required to get this discount. Order now. Gadgets Now is offering flat 11% discount on Samsung Galaxy Grand Prime 4G. Here you get this mobile for just Rs 8888 where as the actual price is Rs 9999. Free shipping also available. Check the features from landing page and place order now. Gadgets Now is offering flat 16% discount on LYF Flame F8 4G VoLTE. The actual price of this smart phone is Rs 4999. Here you get it for just Rs 4199. This mobile is eligible for Jio money offer. EMI also available for this mobile. Buy now. Gadgets Now is offering flat 10% discount on YU Yunicorn - 32GB (Gold Rush). Here you get this mobile for just Rs 9888, where as the actual price is Rs 10990. Free shipping available for this order. EMI also starts from Rs 884 for this offer. Order now. Gadgets Now is giving awesome discounts on smart watches, here the range starts from Rs 619. Brands available here are Apple, Samsung, Sony, LG, Spice, Xiaomi, Lenovo, Asus, Bingo etc. Click here and get more savings on your smart watches online shopping. Buy now. Gadgets Now is giving 4% discount on Lava A97 4G VoLTE smart phone. The actual price of this phone is Rs 5199, here you can get this for Rs 4988. Buy latest gadgets online at Gadgets Now online store and save on your online shopping. Buy now. Gadgets Now is an online where you can buy all latest gadgets. Here Samsung mobiles range starts from Rs 990. Choose from landing page smart phones collection like Samsung Galaxy Note 7, Samsung Galaxy J7 Prime, Samsung Galaxy J Max etc. Order now for all gadgets and get best price. Verified on 23/4/2019 .. Gadgets Now is offering flat 7% discount on Coolpad Mega 2.5D. Here you get this for Rs 6999 where as the actual price is 7499. Shop with HappySale promo codes and save on your Gadgets online shopping. Buy today. 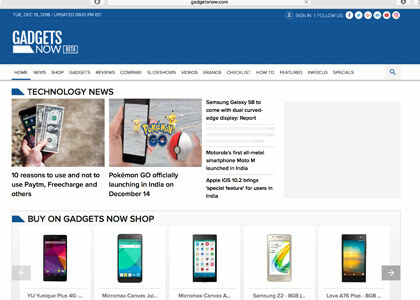 Gadgets Now is a platform where you can buy all latest gadgets online and best savings on your gadgets online purchase. Buy here for Apple tablets where its range starts from Rs 17340 only. Choose from the landing page wast gadgets collection available. Shop using HappySale Gadgets Now coupons and save on your online shopping. Buy now. Gadgets Now is offering best price and free shipping on Redmi 3S Plus - 2GB (Gold). Here you get it for Rs 9299. EMI starting at Rs 831. Shop using offers from HappySale and get huge discounts on your online shopping. Buy now. Gadgets Now is offering Samsung Z2 for just Rs 4460. Order here and get flat 5% OFF. The actual price of Samsung Z2 is Rs 4690. Here you get for Rs 4460. Free shipping and EMI options are also available. Buy latest smat phones at best price here. Order today. Gadgets Now is offering flat Rs 811 OFF on LYF Wind 7i 4G VoLTE - 8GB (Black). The actual price is Rs 5699, here get it for Rs 4888. Order here to get flat 14% OFF. Free shipping also available. EMI starts at Rs 431 only. Buy today. Gadgets Now is offering flat Rs 2009 discount on Meizu M5 mobile. Buy here and avail the benefits like Free shipping and EMI without applying any coupon code. Shop now using offers from HappySale and get huge discounts on your gadgets online orders. Click to place order now. Gadgets Now offers best price on Redmi 4A mobile. Order here and get it for just Rs 5999. No coupon code is required to get this best price. Order for Redmi mobiles using offers from HappySale and get huge discounts on your online shopping. Buy now. Gadgets Now is offering upto 36% discount on trending 4G phones. Use Mobikwik wallet for payment to get up to 100% cashback. Maximum cashback is Rs 200. Choose from brands like Gionee, Asus, HTS etc also avail Jio welcome offer on purchasing of any mobile from Gadgets Now online store. Click to save more on your Gadgets online shopping. Gadgets Now is offering flat 9% OFF on Lenovo A6600 Plus 4G VoLTE. The actual price of this Lenovo mobiles is Rs 6999. Order here and save Rs 650 on your Gadgets Now online orders without using any coupon code. Click to get it today. Shop for the best selling smart phones online at Gadgets Now and avail upto 20% OFF on your orders. No Gadgets Now promo code is required to get this discount. Look on to the site where you can select from top selling branded mobiles and place your order today. Gadgets Now is offering flat Rs 7000 OFF on Apple iPhone 7. Here you get it for 60999 where as the actual price of this mobile is Rs 67999. Order here and enjoy the benefits like free shipping and EMI etc. Check the landing page for more details and place order now. Gadgets Now is giving flat 8% discount on Yu Yureka Plus - 16GB (Moondust Grey) smart phone. Here you get this mobile at Rs 6019, where as the actual price is Rs 6519. No Gadgets Now promo code is needed to get 8% discount. Buy now. Don't miss this offer from Gadgets Now. Shop for the best selling smart phones online at Gadgets Now and avail upto 20% Off on your orders. Look on to the site where you can select from various branded mobiles and place your orders. Not required any Gadgets Now promo codes to avail this best discount offer. Hurry up and bag it today! Gadgets Now is giving amazing discounts on cameras. Buy Cameras online at Gadgets Now online portal and get awesome discounts on your Gadgets Now online shopping. Choose from brands like Canon, Nikon, Kodak, Sony etc. Buy today. Gadgets Now is offering flat 22% discount on Yu Yureka Plus - 16GB (Moondust Grey) smart phone. Here you get this mobile at Rs 6999, where as the actual price is Rs 8999. Shop here for all latest Gadgets collection from Gadgets Now online store and save more on your online shopping. Shop now. Buy Apple smart phones online at Gadgets Now and get flat 4% discount on your purchase. Here you can get Apple iPhone 5S at this best discount price. Not required any Gadgets Now coupon codes to make avail of this discount on your purchase. Look on to the site and make your orders now! Gadgets Now is offering awesome discounts on your Air Conditioners online shopping. Choose from top electric brands like Samsung, LG, Micromax, Blue Star, Carrier, Daikin, Croma, Electrolux, Hitachi etc where the price range starts from Rs 13990. Buy today. Gadgets Now is offering amazing discounts on fitness bands. Here fitness bands range starts from Rs 790 from top brands like Samsung, Sony, HTC, LG, Microsoft, Xiaomi, Fitbit etc. No promo code is required to get this best price on your Gadgets online shopping. Buy now. Gadgets Now is offering best price range on Dell laptops. Here its range starts from Rs 12500 only. No offer code is required to get this best price on latest laptops online shopping. Choose from different specifications available and get more savings on your Gadgets Now online shopping. Buy today. Gadgets Now is offering more savings on latest gadgets online shopping. Shop here and get 6% discount on Samsung Galaxy J2 mobile. Shop here for Rs 8499 where as the actual price is Rs 9016. Choose from landing page and place order. Gadgets Now is offering best price all latest gadgets. Here you can buy Lenovo laptops and get best savings on your online shopping. Here the price range starts from Rs 12999. Shop with HappySale Gadgets Now offers and save on your purchase. Buy today. Gadgets Now is an online portal to buy all latest gadgets at amazing offers. Shop here for Sony TVs, where the price range starts from Rs 12899. Choose from landing page and get best price on your online shopping. Buy now. Gadgets Now is offering best price on your refrigerators online shopping. Shop here for all top brands like Samsung, LG, Siemens, Haier, Whirlpool, Croma, Videocon etc. Shop ar Gadgets Now online store and get more savings. Gadgets Now is offering best price on washing machines online shopping. Shop here from top brands like IFB, Samsung, Panasonic, Bosch, LG, Croma, Electrolux, Godrej etc. Choose from different washing machines types like top load, front load, fully auto matic etc. Buy now. Gadgets Now is giving best price on Daikin air conditioners. Shop here from different capacities like 1 Ton, 1.5 Ton, 1.8 Ton etc. Shop with HappySale online promo codes and get more savings on your online shopping. Shop today. Gadgets Now is offering flat 17% discount on Samsung Galaxy J1 Ace - 4GB (Black). The actual price is 5499, but here you get it for just Rs 4590. EMI also available. Check the landing page for all details and get huge discounts on your online orders. Order now. Gadgets Now Offers flat 11% discount on Intex Aqua Amaze Plus 4G - 8GB (Black). Here you get it for just Rs 4899 where as the actual price is Rs 5499. Free shipping also available. EMI also starting at Rs 438. Check the specifications from landing page and place order. Gadgets Now is offering flat Rs 600 OFF on Karbonn Titanium Vista 4G LTE - 8GB (Champagne White). Here you get it for Rs 4999, where as the actual price is Rs 5600. Free shipping also available. EMI starts at Rs 447. Buy today. Gadgets Now is offering Rs 1620 discount on Moto G4 plus mobile. Free shipping also available for this mobile. EMI starts from Rs 1151. 16MP Rear, 5MP Front Camera etc. Check the landing page for more specifications and place order today. Gadgets Now is offering flat Rs 319 discount on Moto E4 mobile. Use Jio wallet for payment to get flat 5% cashback. Also avail FREE shipping without using any coupon code. Order now. Gadgets Now is offering gadegets at amazing discounts. Shop here for Sony mobiles where the range starts from Rs 4494. Pick from the varieties like Sony Xperia dual, Sony Xperia M5, Sony Xperia Z3 + Dual etc and get more savings on your Gadgets online shopping. Shop now. Gadgets Now brings flat 5% discount on Micromax Canvas 5 Lite smart phone. The actual price of the product is Rs 7499, here you get this for Rs 7150 without applying any promo code. Shop here and get more savings on your Gadgets online shopping. Gadgets Now brings flat 5% discount on Gionee F103 Pro - 16GB (Pearl White) smart phone. The actual price of this Gionee mobile is Rs 11610. At Gadgets Now online shopping you get it for Rs 9998 only. Enjoy these savings by placing order here. Click to get it now. Gadgets Now is offering best price on Gionee M5 Plus - 64GB phone at Rs 20600 only. Actual price of Gionee M5 Plus is Rs 21990. But Gadgets Now is giving flat 6% discount to save Rs 1390 on your pocket. EMI is also available. Grab it now. Gadgets Now is offering flat 8% discount on Yu Yureka Plus - 16GB (Moondust Grey) smart phone. Here you get this mobile at Rs 6019, where as the actual price is Rs 6519. Use this Gadgets Now coupon code to get additional 2.5% discount on your online payments. Shop here for all latest Gadgets collection from Gadgets Now online store and save more on your online shopping. Shop today. No matter which tech toy you are looking for, Gadgets Now will help you make the right decision. Shop for the best selling smart phones online at Gadgets Now and get upto 20% Off on your orders. Use this Gadgets Now discount coupon to get additional 2% instant discount on your online payments. Look on to the site where you can select from various branded mobiles and place order now. No one can think of the new age lifestyle without the use of advanced gadgets! For instance, from our every day Smartphone’s, laptop devices to the electric kettles and microwaves, the modern day lifestyle is dependent on the advanced and swank gadgets. However, it has often been observed that buying these gadgets from shops often costs more. If you are a budget shopper and want to save on all your gadget purchases, the best option is to avail them online as online shopping offers you more choices as well as better deals and discounts. And one brand that you can opt in for the same is Gadgets Now. To make the most of the discounts you can say yes to the gadget now coupons that are available online for you to select from. If you want to select it all from one website so that it’s easy for you, simply browse through HappySale and you will have the best offers to select from. Every avid online shopper wants to save more online on their electronic gadgets that they purchase! And when you use up the gadget now coupon codes, you can save great on products like USB cables, music players, Smartphone and its allied accessories, Bluetooth devices, extension cords, ebook readers, movie players, pen drives, and many more at a discounted price. There are deals and offers for the new as well as old users. In addition to that you can also make the most of the buy 1 and get 1 free offers. That aside, other deals and offers come in the form of promotional discounts, site wide offers, cashback deals and discounts that are applicable when you pay using credit/debit cards of chosen banks and online wallets. Sometimes, the promotional discounts can start at a flat 20% and go upto as much as 50% to 70% enabling you to save more on all your gadget buys online for yourself or others. Do you want to have access to the best and the authentic gadget now promo codes? If yes, then all you need to do is simply browse through HappySale as here you will only get to select from discount coupons that are verified and won’t lead to any hassles when you are selecting and activating the same. Furthermore, you also have the chance to read the offer and deal descriptions to know more on the same and then activate the same before the offer expires. So browse well, select the discount code, opt in for the “show code” option and then redeem your discount and save big on your choicest gadgets.